What is the benefits for patients? What is the benefits for doctors? Carbonic Acid is naturally present in the human body and without it our bodies will not be able to function in a normal way. This therapy application is done by introducing CO2 into the chamber to react with the highly excited H2O steam molecules to form a new compound called Carbonic Acid (H2CO3) that have the ability to penetrate effortlessly into the skin and bloodstream dew to its highly soluble state which increase the oxygen absorption ability of blood, musculature and skin. The Bohr effect is not the only radical effect that carbonic acid has on the human body. Its other very distinct mechanisms that relates to stress therapy, Cellulite treatment, cardiovascular disorders and toning of the skin and reducing scar marks are discussed in the following segment. The conclusion of the Bohr effect is that it increase the energy production that is needed for the body to maintain, defend and enhance itself. Carbonic Acid have several well researched and published scientific mechanisms of action that induce its very distinct and powerful effects on the body. As technology advanced, it has now become much easier, cost effective and practical to harvest the benefits of this incredible compound. It enhances oxygen delivery at cellular level in the muscles, organs, brain, skin and other parts of the body. 1. CO2 bubbles cling to skin. 2. CO2 diffusion through the skin (not from the gas bubbles). 3. CO2 absorption (10-80 mL CO2/min; average of 30 mL/min/m2 body surface area. Corresponding to about 1.8-4.5 L/h) (= 10% of amount of CO2 produced by the body in the same time). Flushing of the skin, presence of distinct ischemic boundry line (at and above 300-500 mg CO2/L). Dilation of precapillary arterioles and increase in capillaries through which blood is flowing. Promotion of blood flow through capillaries. Increase in amplitude of spontanious blow flow fluctuation (“vasomotion”). Inhibition of cold receptors and stimulation of warmth receptors, thereby lowering the intermediate temperature from 35°C (fresh water) to 32-33° (CO2 water). In a full bath at 32-33°C, the core body temperature decreases 0.5-1.0°C. Result: Low-volume load (HMV increase does not exceed 30 to 50%) under economic (trophotropic) conditions of mild hypothermia. Adaptive changes in circulatory system over a prolonged period of time. The direct effects of CO2 baths are utilized for therapeutic ends. In addition, the pharmacological effects of carbon dioxide have been studied and are well documented. However, the sustained long-term effects that are desired can be obtained only through serial application, and so it is such serial application that determines the ultimate effectiveness of CO2 baths. These long term effects are not merely the sum of the individual effects. Rather, they are brought out by fundamental changes in the autonomic nervous system in stimulation, Response and adaptation therapy2.10 . There are instances where trophotropic economic changes in the autonomic trigger a temporary aggravation in the patients state (cure crisis) with the passage of time10 (Fig. 6: CO2 baths 4-7). 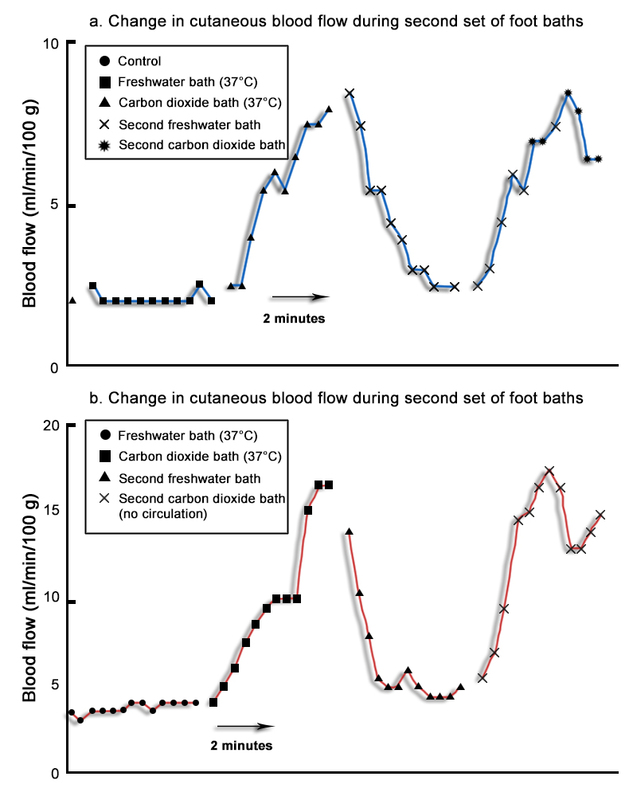 Research done by Japanese Scientists show in the following diagram what significant impact carbonic acid or a CO2 bath has on the blood flow in the feet of ischemic patients. Delayed wound healing, topical blood flow disorders, CO2 therapy indications for which water baths are contraindicated. The various types of decompensation, such as acute pyretic diseases, consumptive diseases and ulcers, for which immersion full baths are contraindicated on the account of the effects of immersion are generally contraindicated addition, contraindications specific to CO2 balneotherapy include severe hypertension, new cardiac infarction’s, aortic and mitral valve stenosis, severe congenital heart failure, cor pulmonale, bronchopulmonary diseases accompanied by hypercapnia, and acute inflammatory vascular diseases. CO2 balneotherapy is also contraindicated severe disorders. No natural remedies can make use of such a broad and diverse base of knowledge as carbon dioxide baths. A number of earlier indications have become outdated and are no longer useful with the development of cerebrovascular disorders. When a CO2 spring source is used in a warm bath, treatment must be safely carried out in such a way as to keep people from inhaling a large amount of CO2. Water surface measurements at CO2 spas have shown that 2-4%, and sometimes even higher levels, of CO2 are present in the air. The patient should be instructed to avoid bringing the nose or mouth any closer than necessary to the surface of the water and to avoid undue exertion while in the CO2 bath. Even with such precautions, central nervous system symptoms (hypertension, cerebral hypoxia syndrome) will occasionally appear. It is my hope that baleotherapy which is being carefully studied in this way will once again become widely used in combined therapy programs, rehabilitation programs, and preventive care programs conducted in various places as cures.